I was deeply saddened to learn of the passing of Bill Hertz, who represented Mann Theatres for many years and was a champion of our Hollywood community. Bill embodied what a gentleman was – bright, dedicated to serving our community, and always generous. My thoughts and prayers are with his wife and family. He will be missed by many of us who had the privilege of working with him. Students at Dayton Heights Elementary School will be safer and healthier thanks to the new expansion of their playground. This afternoon I joined community members to celebrate the playground’s completion. 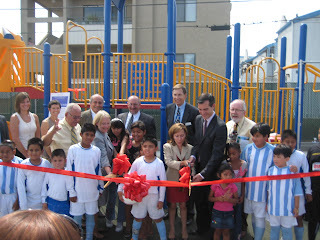 Previously, students had to cross the street to use a nearby playground, but funding from Prop K and the joint efforts of the City of Los Angeles and LAUSD helped to convert an adjacent dirt lot to a soccer field and jungle gym. The park will also be available for community use on weekends and during non-school operation hours on weekdays. Hundreds of Los Angeles firefighters have made the ultimate sacrifice while serving our city, and today we ensured that their lives and dedicated service will never be forgotten. This morning I joined Councilmembers Tom LaBonge, Dennis Zine, LAFD Battalion Chief Greg Gibson and the surviving family members of fallen firefighters at the ribbon-cutting ceremony of the LAFD Fallen Firefighter Memorial and memorial plaza. The memorial is the first of its type in the city’s history. 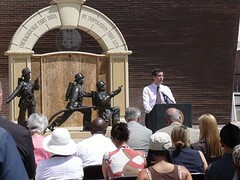 Five life-size bronze statues depict firefighters attacking a blaze and a paramedic attending a wounded colleague. Behind, the 254 names of the fallen firefighters are etched in a granite wall and arched above is the memorial motto, “Courageously They Died, By Inspiration They Live!” The memorial is just outside Old Fire Station 27 at the Los Angeles Fire Department Historical Society Museum in the heart of Hollywood. This Sunday the LAFD will hold a public unveiling of the memorial, located at 1355 N. Cahuenga Boulevard. Please join us in celebration and appreciation of those who have fallen in the line of duty. You can find out more about the memorial or help provide financial support through the LAFDHS website. Securing housing is one of the most significant challenges facing Los Angeles – especially for people with special needs. 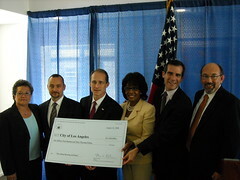 This morning, I joined Housing and Urban Development Secretary Steve Preston, Congresswoman Maxine Waters, and representatives from local HIV/AIDS service organizations to accept a $1.4 million grant from the U.S. Department of Housing and Urban Development that will go toward the creation of supportive housing for Angelenos living with HIV/AIDS. This funding is an important component of the housing solution in Los Angeles. It supports the housing, and the services, that we need to combat homelessness and stabilize communities. Los Angeles is one of 18 localities receiving funds totaling over $19.4M through HUD's Housing Opportunities for Persons with AIDS Program (HOPWA). 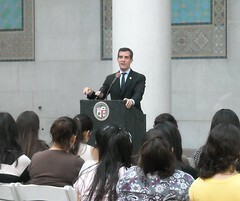 Nearly 100 local residents joined me at City Hall this morning for a Government 101 workshop. Attendees learned how to access city resources and become effective advocates for their communities by observing a City Council meeting and attending seminars on how residents can influence the city’s legislative process. I started Government 101 to connect people with city resources, because I meet people every day who want to help their communities and want to learn more about how they can do so effectively. Through the program, we’ve helped over 1,000 people learn how to partner with government, businesses, and local organizations to bring real change to their neighborhoods. If you missed the workshop, be sure to sign up for the next Government 101!